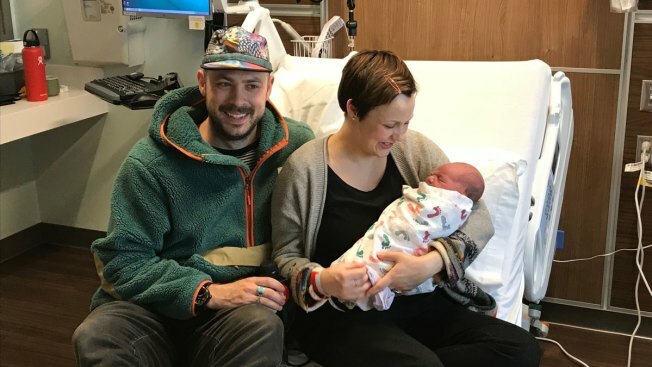 Francis, born Friday at St. Luke's hospital, was wheeled over Saturday with his mother Kaitlynn Peterson to check in as the first patients at the adjacent California Pacific Medical Center Mission Bernal campus. He won't realize it until much later, but Francis Peterson will eventually be able to brag that he was just hours old when he became the last baby born at one hospital and the first patient at another. Francis, who weighed in at 8 pounds, 2 ounces, was the last baby born at St. Luke's, which opened its doors in 1871, hospital spokesman Dean Fryer said. Baby and mom were among an estimated 35 patients transferred to the Mission District facility, 3555 Cesar Chavez St., when not-for-profit Sutter Health network officially opened doors to the new medical center. Two expectant mothers who have checked in to the new facility may soon give birth to the first babies that will be born there, Fryer said. The 120-bed hospital's 215,000 square feet of acute care facilities, clinical and administrative space include seven operating rooms and an expanded emergency department with 16 exam and treatment rooms, officials said. In addition, an acute care unit for the elderly will offer 19 private rooms to accommodate the needs of senior patients. The new campus will also offer private patient rooms with views, including space for family members to stay the night. The facility has a smart pneumatic tube system that tracks supplies, medications and blood samples in an effort to reduce errors and improve turnaround time. A self-sufficient design allows the hospital to operate without city utilities for up to four days. "The new Sutter Health CPMC Mission Bernal Campus is a state-of-the-art facility that will serve San Francisco for generations to come," Mayor London Breed said.